The CFA has evolved from a rough network of local fire brigades, to become one of the world’s largest volunteer emergency services associations. T will have to undertake Wildfire Minimum Skills Training, before he’s allowed to turn out in a fire truck. Thank goodness for that. He’ll learn about personal protection, map reading, fire behaviour and suppression. He’ll receive communications training. This will complement what he already learned this year during Year Ten. His school offered the practical subject of Fire and the Community to its students. So T will be well prepared by the time he helps conduct a fuel reduction burn, or attends a road accident. Or turns out to a full blown bushfire. It’s a wonderful opportunity for him to give something back – to become a valuable and responsible member of his community. I am of course, very proud. I will try to hold onto this thought when the sirens next ring, and my stomach coils in nasty knots. This entry was posted in Home and Family and tagged Bushfire, CFA by jenniferscoullar. Bookmark the permalink. Just found your blog 🙂 Will add to my blog roll! 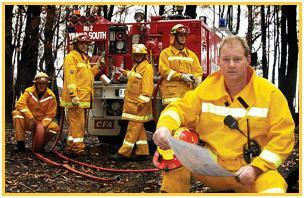 I live in Warrandyte and I know how important a role the CFA play in keeping us all alive. I just wish they had a greater say in the prevention side of things. At the moment they have to dance around local council and state government ‘policies’ that are often in direct conflict with good fire management and prevention. Here’s hoping that 2012 will see a little more common sense coming into the debate. Go the CFA! Go CFA indeed! Let’s hope we don’t need them very much this year. By the way, I love to dig holes too. Nothing more satisfying than digging a perfect post hole! The last two days of heat were not pleasant but I’m hoping they’ll serve to focus people’s minds on the fact that this summer could be bad in terms of bushfires. Hope your son is doing well at his training.